What are the most successful cities in Michigan? Many people live where they do because, well, they love it. It may have a good school district, green space or the hustle and bustling downtown area. 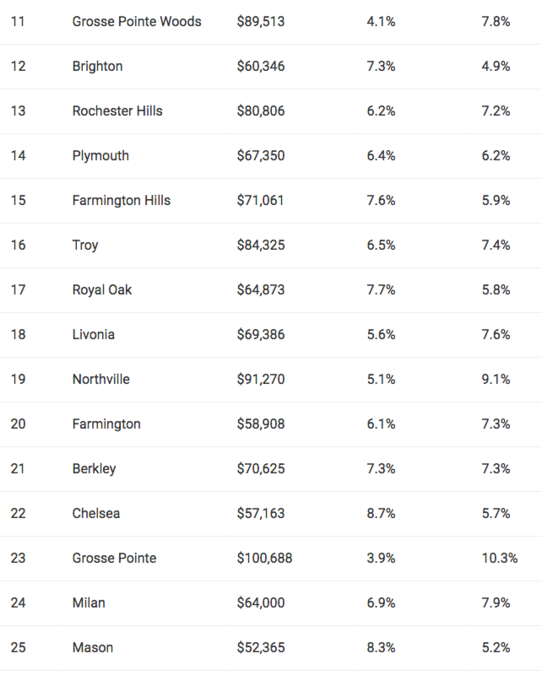 To take a look at which cities in Michigan are the most successful, the website Zippia did some research to see what are the best places to live in Michigan. To determine which are the most successful cities, Zippia didn’t only look at household income, but also at the property level and unemployment rate of the cities. The information was gathered from the 2010-2014 American Community Survey. While no mid-Michigan city made the top 10 list, Mason came in at No. 25 with a median household income of $52,365, a poverty rate of 8.3-percent and the unemployment rate at 5.2-percent. For the rest of the cities up to 100, click here.